The TV set up was fine. I was a bit nervous it took so long to tune in the Freeview (DTV-B) signal but it got there in the end. 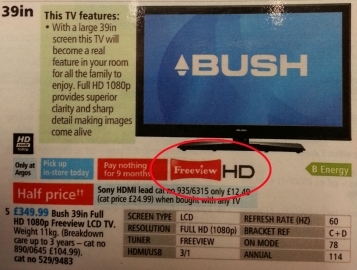 I was a little disappointed that the catalogue listing had made it appear that it was Freeview HD – but it isn’t. It’s Freeview, and it’s HD, but never the twain shall meet. The arrangement of the logos implied to me at the time that the Bush TV was Freeview HD. It was only after I tuned it in I realised it wasn’t. Anyway, I was prepared to accept that as a lesson that I should double-check everything but then I hit the real problem: the picture quality. Despite having a review score of 4.5/5 on the Argos web site, the picture quality is absolutely awful. The brights are too bright and the darks are too dark, and it seems no amount of playing with settings will change that. People’s faces positively glow when they’re in any kind of brightly lit scene, and any attempt to mitigate this means that darker colours all merge into one dark mess in indoor scenes (think the pub in Eastenders). I went back to the reviews on the Argos web site because I can’t believe these people are describing the same TV. I was slightly suspicious of reviews on the site selling the product and whether there would be some form of censorship in play. When I tried to leave an honest review reflecting the true quality of this TV I couldn’t find any option to do this, though I think their site was redesigned the other day, so hoping this is just an oversight there rather than anything sinister. So it turns out that the Bush TV was indeed pretty bad – I should’ve paid more heed to my dad’s opinion of Bush products but it seemed like a good deal. Talk about buyer’s remorse! It needs to go back to the shop, Argos should really be embarrassed to be selling products like that in the first place, much less trying to make out they’re worth £350. I’m publishing this in the hope that some other poor sod about to make the same mistake will be spared the disappointment. Do yourself a favour, go to Richer Sounds instead – or at least somewhere you can see the TV you’re getting in action. Or failing that, just don’t buy a Bush TV – they are as bad as you think! Don’t you hate those disgustingly easy quiz “questions” on TV? IIRC the reason for the simple questions is that the TV companies can charge people to enter a competition but avoid lottery regulations by claiming there is an element of “skill” in the game. Anyway, at 2AM this morning while working on a web site I spotted this beauty of a jumbled footballer’s name on Channel Five‘s “Five US” channel courtesy of Quiz Call. And at the very least I counted 300 odd suckers who entered this in the space of 5 minutes. a bang up job there.